What A Rush! Capitals’ Line Rush of the Game: A Deke From Dima Leads to A Deuce for Backstrom! In a game that saw the Capitals score six goals en route to a 6-3 win over the Tampa Bay Lightning, there were no doubt a multitude of line rushes for us to choose from for the Capitals’ Line Rush of the Game. And with highlight reel markers from Alex Ovechkin and T.J. Oshie, it was not an easy one. Tonight’s LROTG goes to center Nicklas Backstrom and defenseman Dmitry Orlov. Having already scored his 20th goal of the season (a goal that saw him take sole possession of eighth place on the all-time points list for Swedish-born players), Backstrom netted yet another goal in the second period of play against the Bolts. And not only was the finish from Backstrom a beautiful play, but the move by defenseman Dmitry Orlov to get the puck to Backstrom was even prettier. With the puck below the goal-line, Backstrom dished it to Orlov, who corralled the puck at the blueline and made a fantastic move around Tampa Bay forward Brayden Point, who struggled to maintain Orlov’s quickness. 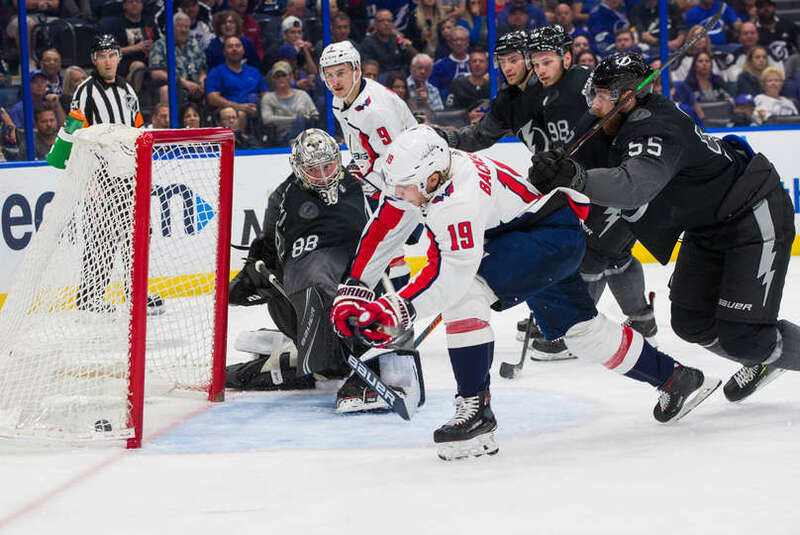 As Orlov moved towards the left of Bolts’ netminder Andrei Vasilevskiy, Backstrom backed onto the far side of the net, and Orlov dished the puck to the Caps’ star center, who made no mistake in knotting his second of the game and 21st of the 2018-19 season. The goal added to Backstrom’s fourth consecutive 20-goal season (the first time in his 11-season career in which he has scored 20 or more goals in four straight seasons) and the former first-round pick added an assist in the game for three points on the night. This entry was posted in Games, News, NHL, Teams, Washington Capitals and tagged Lines, Michael Fleetwood, Tampa Bay Lightning, Washington Capitals, What A Rush, Win. Bookmark the permalink.